The Rutgers University Faculty Council has approved a resolution calling upon the university’s Board of Governors to rescind its invitation to Condoleezza Rice to speak at commencement. It was just last month when the board unanimously picked Rice to receive an honorary Doctor of Laws degree and serve as its principal commencement speaker for the upcoming graduation ceremonies. Rice, who was George W. Bush’s second Secretary of State, will also be paid $35,000 for her efforts. But the faculty council’s resolution has thrown a sizable wrench into the university’s graduation gears, plans and festivities. It has reminded us all of Rice’s distasteful war record, including her misleading of the public about the ill-advised and costly Iraq war. Recall her dire warnings against Saddam Hussein’s soon-to-come “mushroom cloud” which would destroy us all? 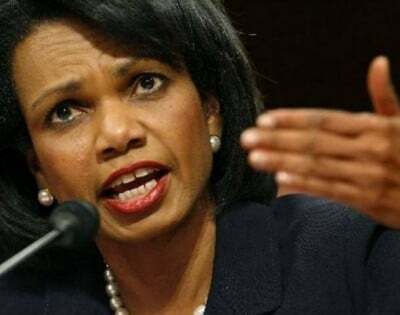 “Condoleezza Rice … played a prominent role in (the Bush) administration’s effort to mislead the American people about the presence of weapons of mass destruction,” according to the resolution. And she “at the very least condoned the Bush administration’s policy of ‘enhanced interrogation techniques’ such as water boarding,” the resolution read. As might be expected, the professors are not alone in their opposition to Rice’s presence on campus. Several petitions are circulating among students as well. A spokeswoman for Rice declined to comment. “Dr. Rice is a highly accomplished and respected diplomat, scholar and author, and we are excited that she has agreed to address our graduates and guests at Commencement,” Trevor said. Rice is no stranger to this kind of controversy, however. Back in 2006, while still in office, she gave the commencement address at Boston College. A large number of students and faculty stood and turned their backs to her throughout her address. And as recently as 2012, she gave the commencement address at Southern Methodist University, home to the George W. Bush Presidential Library and Museum. No back-turning occurred at that event, however. One of then-Sen. Barack Obama’s first votes in the Senate was in favor of the confirmation of Rice as secretary of state. I knew then that Obama was not all he was cracked up to be. Folks in Chicago were left scratching our heads wondering how could he possibly vote to confirm Bush’s national security adviser as secretary of state? Turns out that that was one of his less controversial betrayals of everything he ran and stood for. My unsolicited advice, then, to the students and faculty of Rutgers is this: Yes, Rice is “free” to speak in the name of both “free speech” and “academic freedom.” But do not simply follow Boston College’s example by turning your backs on Rice. Actually get up and march out of the ceremony en masse if she dares to show her face. There are rumored to be arrest warrants waiting for her, Bush, Rumsfeld, Cheney – the whole damn crew – should they ever venture beyond the borders of the US. Herbert Dyer, Jr. is based in Chicago, Illinois, United States of America, and is an Anchor for Allvoices. Articles by: Herbert Dyer Jr.